Namesake Alan B. Miller, Chairman and CEO of Universal Health Services, said the new building will "elevate faculty, staff, students and everyone who sees it." Opening A fife and drum corps opened the ceremony. Speaking of Miller Hall Dedication speaker Sandra Day O'Connor, Chancellor of William & Mary, said she was "thrilled to see" Alan B. Miller Hall. Closing remarks Dean Larry Pulley said, "We intend to do great things. To count. To make a difference. That is our cause." Dean Larry Pulley "Revolutionaries are still welcome here." Self-guided tours After the dedication ceremony, guests were invited to tour the new building. William & Mary’s Raymond A. Mason School of Business celebrated its new home, Alan B. Miller Hall, with a public dedication Oct. 2, 2009. 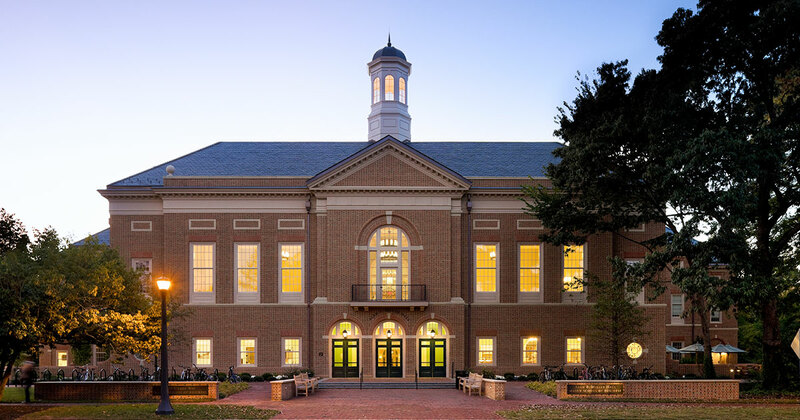 With the sound of a Fifes and Drum Corps leading the way, more than 600 faculty, staff, students, alumni, community members and other friends of William & Mary joined in to celebrate a new day in business education at the nation’s second oldest College. “This is an exceptional building,” Alan B. Miller, the building’s namesake and ’58 alumnus, told those in attendance under the large white tent in the facility’s courtyard. Plenty of people – more than 600 – came to see the new building Friday. Among those marking the opening included William & Mary President Taylor Reveley, Chancellor and former U.S. Supreme Court Justice Sandra Day O’Connor. Also joining Dean Larry Pulley and Miller was ’59 alumnus Chip Mason, who the school was named for in 2005, and architect Robert A.M. Stern, whose architectural firm designed the 166,000-square-foot facility.